Yesterday, I mentioned I went to check out something I’m thinking of buying! 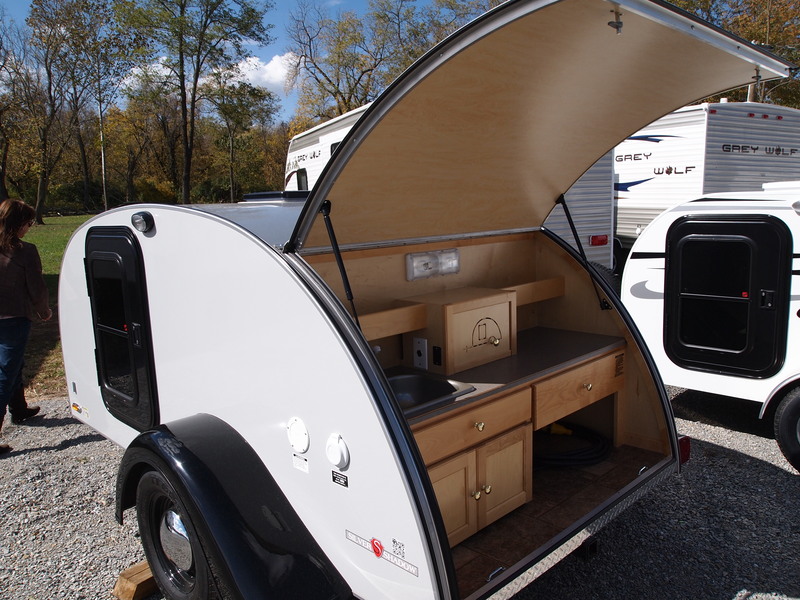 It’s a Little Guy Teardrop Camper! The manufacturer is located in Massillon, Ohio and they’re built by Amish craftsmen. You can find a dealer in 35 of the States. These used to be popular back in the 50’s and have just recently begun to take off again because of the high gas prices. Weighing in under 1000 lbs., most vehicles, even small cars like my Honda Civic, can tow them! Although my car is rated to tow 1000 lbs., when you get all of your stuff into one, I’d prefer to be under that weight! 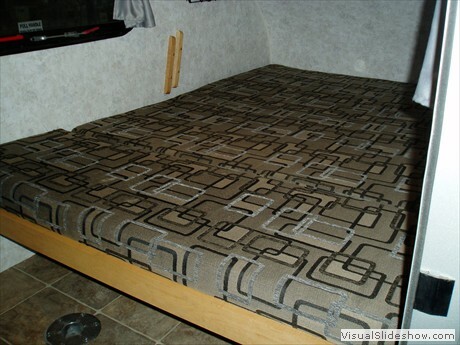 I want to take a road trip…stay for free occasionally in Wal-Mart parking lots…when I’m not staying at campgrounds. Perhaps through North Carolina to the coast…down to Charleston…Savannah…Destin Beach, Florida…New Orleans and then on down to Florida. My friends laugh when I say I might stay in Wal-Mart parking lots! 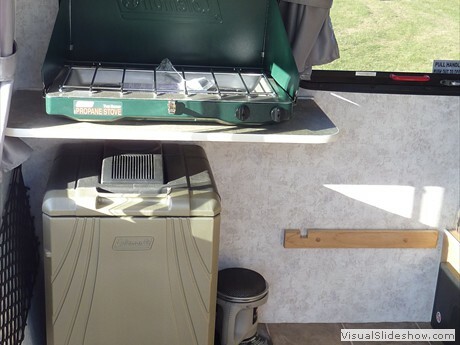 This is the Silver Shadow model. It has the most features and the largest price tag. 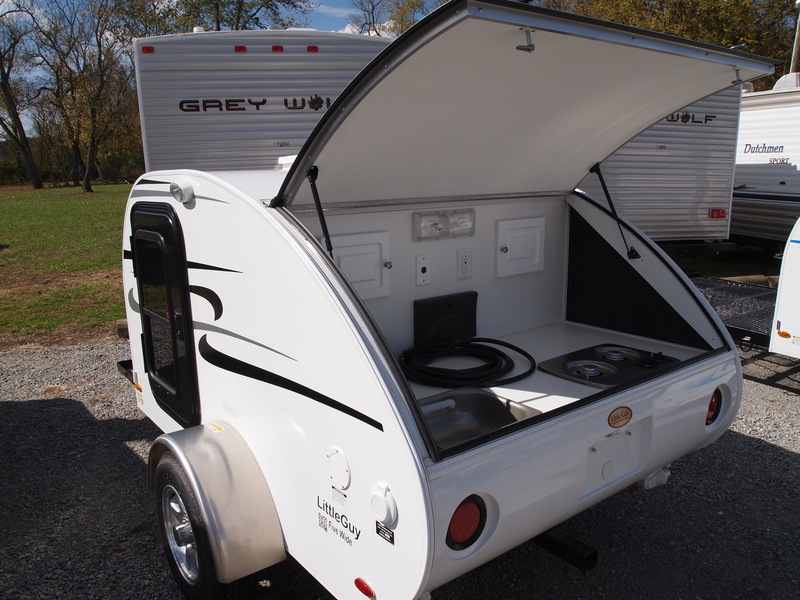 The 5-Wide Platform is 5-ft. wide inside (imagine that)–queen size bed–and as you can see has a sink and built-in propane stove. The Little Guy Joey weighs in at less than 500 lbs. and at $5,000 is quite affordable. 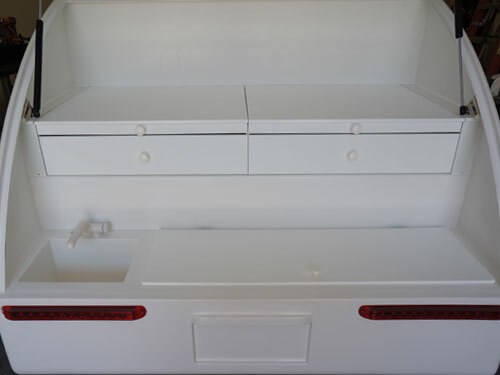 The kitchen counter folds down when not in use. The dimensions of this one are 4’x7′ with a full size bed… so when I laid down in it my feet were hitting the kitchen table (remember I’m 5’11” tall). They make a 4’x8′, but I think it’s a bit too small and I would rather have a sink. 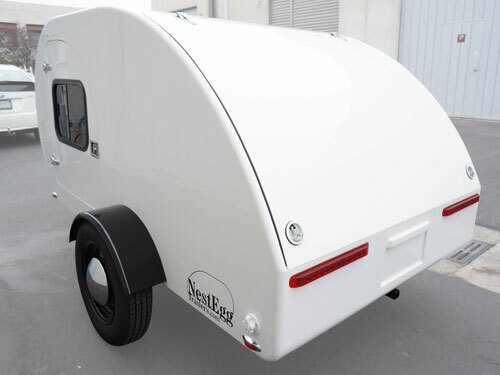 After scouring the internet for a couple of days, I found the Nestegg Campers out in California. They weigh 700 lbs. and range in price, depending upon extras, from $10,000 to $11,000. You have to wait a couple of months for them to make one for you. Serro Scotty is very similar to the following Prolites below, but they weigh 960 lbs. and I’m trying to keep it below 800! There’s a company in Canada called Prolite and I was really excited to find them. 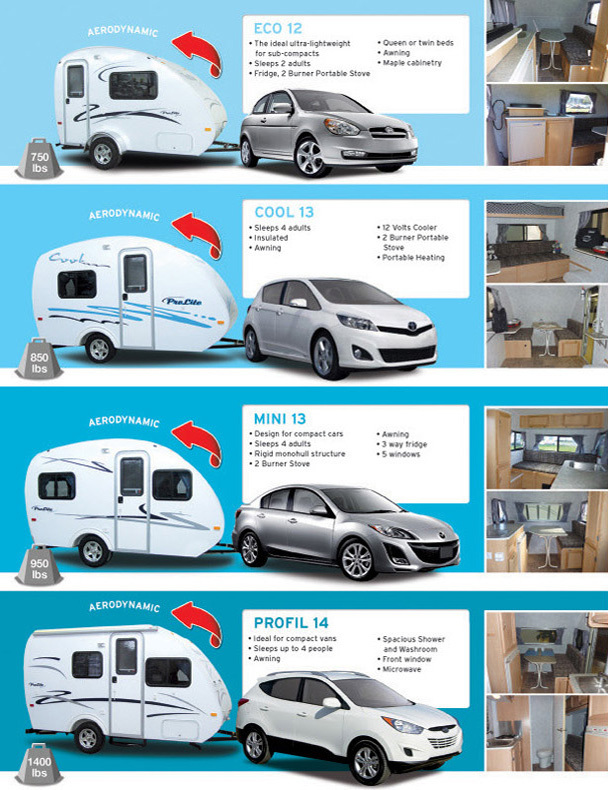 As you can see from the below brochure, you can cook and do dishes inside and they have a lot of standard features. 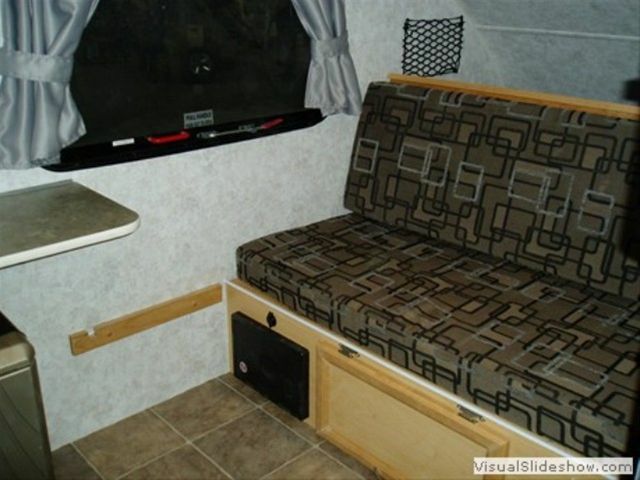 I like the idea of being able to put your feet on the floor inside. The Eco is $15,000 (Canadian dollars) (750 lbs. ), but the Cool 13 is only $12,500 and 850 lbs. Those prices are including the extra $1500 they charge for misc. 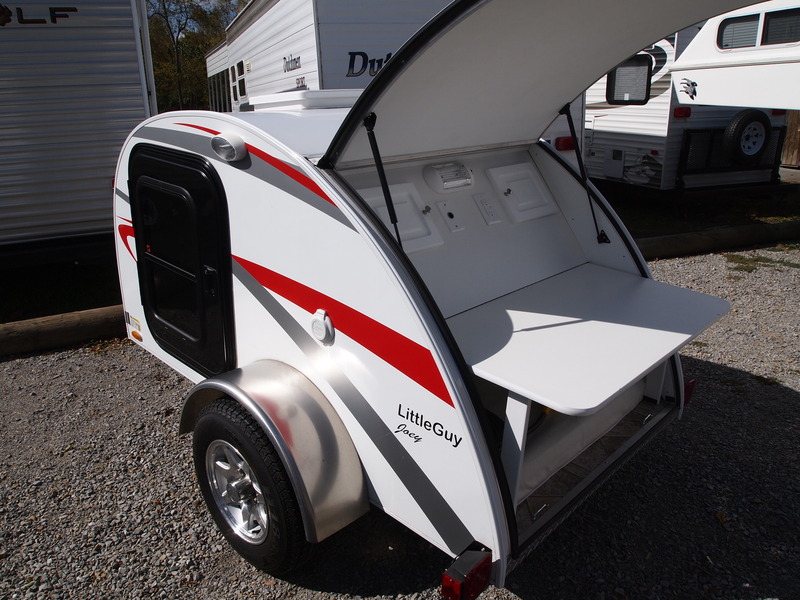 There is an even lighter model called the Suite that looks similar to the Eco, weighs 550 lbs. and is only $8,500.00. I would have to drive 9 hours to Canada to pick it up. What’s a girl to do? P.S. I’m also thinking of just taking my trusty tent and camping! I returned in June from spending 40 days in 7 countries of Africa and camped 26 nights. Before my trip, other travelers gave me tips on things to take that would come in handy and I did some research…so here is a list of some items that you should definitely take on an Overland Truck adventure! 1. Peaceful Sleep Mosquito Repellent. It doesn’t have the toxic “deet” chemical in it, is less expensive and works great! 2. Duct Tape. If you wrap some around a pen or pencil, you don’t have an entire bulky roll with you. I used it a number of times and let others use it also for a variety of purposes. 3. Audiobooks on I-Pod. Many of the roads in Africa are bumpy and even if you have a cast iron stomach like me…reading from your Kindle or book does become a bit aggravating! 4. Items to barter with, for playing with children, or to give away. I took a couple of old t-shirts, 3 pairs of flip-flops from the dollar store, bubbles to blow for the children, and beach balls to play with on the overland truck and then give away to children. If you’re worried about taking up precious suitcase room, you’ll then free up some space to bring home some African crafts…like their beautiful wood carvings. 5. Headlamp (hands-free). This should be number 1! You’re arriving to your campsite, sometimes after dark, and putting up your tent is so much easier with a headlamp! 6. Large plastic bag for clothes. Many of the showers are very small and your clean clothes will get wet if you don’t have them in a plastic bag. Actually, I had quite a few different size plastic bags…they come in handy! 7. Rolling duffel bag with compartments. Most of the people had a backpack and they would have to pull everything out of it to gain access to anything. This rolling duffel that converts into a backpack worked great and I used my regular backpack for all of my electronic gear and other items. I was able to roll it just about everywhere, rather than carrying! If you’d like to know exactly what I packed, see this post. 8. Sewing kit with needle. A fellow passenger and I both used the needle for a splinter. 9. Extra camera. The camera of one of the guys on our trip malfunctioned because he used it at Victoria Falls! When you’re traveling and camping through all types of terrain… sand, water, dirt, and having to keep track of all of your possessions, anything can happen! 10. Laundry soap & plug. You can have someone do your laundry for you, but some places are rather expensive, so I do my own also. 11. Wet wipe sanitizer. I also had regular liquid sanitizer, but the wet wipes were nice because it’s very dusty/dirty in the desert and just camping in general! 12. More $ than you thought you’d need. I continually took money out of the ATM, even though I took $400 with me. At one point I was a millionaire. In Zambia, the Kwacha is 5,300 to $1 US dollar. So, when I took out 1,000,000.00 it equaled $189.00. 13. Your sense of adventure and patience. 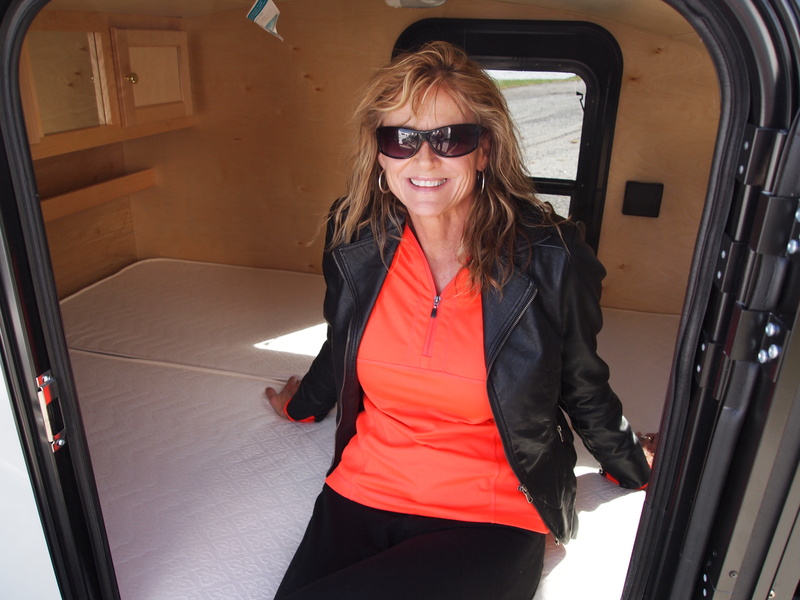 Being cooped up on a bumpy vehicle for 140 hours over the course of 20 driving days out of the 35 total tour days, with people of different age groups, nationalities and personalities, can be taxing. I think our group did a great job of getting along together! The rewards are definitely worth it! On my trip, I broke my Kindle on one of the flights over to Africa, lost my expensive yoga towel (used as my super absorbent all-purpose towel), my Swiss army knife was confiscated at the Amsterdam airport on my way back (I forgot to pack it in my checked bag), I broke the wireless mouse for my laptop and forgot to take my camcorder charger. I’m the type person that doesn’t let things like this bother me…because once its done…its done! I hope this helped and have a great time on your Overland Truck Adventure in Africa!! I was going to say Bon Voyage…but that’s what you’re supposed to say to me! Good Journey! There are hundreds of languages in Africa, but I chose one of the South African versions of Goodbye–Totsiens. Also, french is spoken in some African countries–so, Au revoir! My girlfriends, my son and his girlfriend are visiting tonight…before I leave tomorrow. I wanted to show you my traveling gear (wrinkle-free travel suit), so…here I am! I love to read packing tips or articles about travel gear, so I thought I’d share what I’m taking on my al most six-week–Adventure in Africa trip– in April 2012. I ordered this rolling duffel bag that converts into a backpack from SierraTradingPost for $69.95. When I return from the trip…I’ll let you know how it held up. (2) hats, No rthface hiking boots–$68 from the outlet mall (normally $140 at Northface), flip-flops, hairdryer, hair brush, Manduka towel, roll of toilet paper, Mountain Hardwear 32 degree rated sleeping bag (weighs 2 lbs. and compresses to 10″x6″) $112 from Sierratradingpost.com, flat sheet (in case it’s too warm for sleeping bag), gift for couchsurfing hosts, pocket knife and photocopies of passport/travel insurance/vaccination record w/yellow fever certification, itinerary, G adventures vouchers and pre-departure info. Before deciding on a sleeping bag…I went with a girlfriend to Northface at the outlet mall and tried one out. Face cream (daytime with sunscreen)(nighttime), shampoo, conditioner, hair gel, face wash, facial towelette, body wash, sunscreen, body lotion, deodorant, hand sanitizer, Wet wipes sanitizer, toothpaste, floss, tweezers, makeup (even in Africa), Imodium, Benadryl, q-tips, cotton balls, pre-treated pads to remove nail polish, shower cap, nail polish, laundry rope/plug/camp suds, 40% deet bug spray, and water purification tablets. Total weight – 44 lbs. Columbia omni-heat (lightweight) fleece top, (1) Eddie Bauer lightweight travel/hiking pants, Gorillapod tripod, deck of cards, reading glasses, contact lenses, regular glasses, sunglasses, (3) Power bars (snack), travel clock, band-aids, reading light, Airborne tablets, matches, nail file/clippers, hair bands, small waterproof bag, medication (split between backpack and travel purse…in case one is stolen). Folder with Documents: photocopies of passport/travel insurance/vaccination record w/yellow fever certification, itinerary, airline e-ticket, G adventures vouchers and pre-departure info. I’ll be wearing a black travel suit that doesn’t wrinkle with a pink sleeveless top, a money belt with $400, (2) credit cards, debit card and black Merrill Sports Sandals. To some of you that may seem like a lot and to others…not much. If I were going on an around-the-world trip or backpacking through Europe, I wouldn’t bring as much. I know that seems odd, but I would be more concerned with weight and would purchase more things as I needed them. If you noticed, I put a change of clothes in my carry on backpack…in case my luggage doesn’t make it!